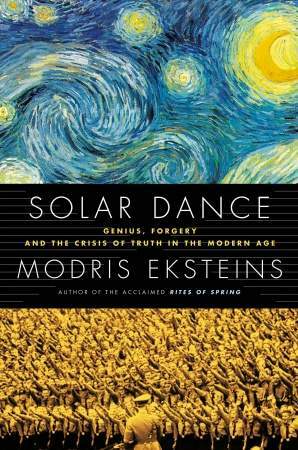 "History is a form of conscience"
Based on the book Solar Dance: Genius, Forgery and the Crisis of Truth in the Modern Age by renowned historian Modris Eksteins (Rites of Spring, Walking Since Daybreak,) the feature-length docu-drama tells a story of the quest for authenticity, with a memorable twist. It is Berlin,1932, the dying days of the Weimar Republic. Otto Wacker, a handsome art dealer and dancer, stands trial for art fraud. He is accused of forging 32 Vincent Van Gogh paintings and selling them to the top collectors and museums of the world. He has enlisted the best experts in the field to authenticate the paintings. Among the confused public, there is great sympathy for Wacker, this “man of honour.” But as the trial goes on, not only Wacker, but the assembled experts, along with the shaky Republic itself, are on trial. What is real and what is fake? Solar Dance draws on a major archive of unseen material that has come to light due to initial publicity about this film. There is an interview with Otto Wacker shot in East Berlin in 1967, copious footage covering the art fraud trial of 1932, plus a radio interview with Nazi propaganda minister Joseph Goebbels, discussing the trial and van Gogh. Otto Wacker danced all his life, most often performing in that famous tale of many stories, Scheherazade. The extraordinary Wacker footage contains a previously undiscovered film of this performance made by his lover at the time, Hans von Meesterkamp, who was interviewed in 2008 at age 100. This archive footage is combined with dramatic re-enactments showing the trial and Wacker’s successful efforts to involve Europe’s finest art experts in his scheme, leaving their reputations forever shattered, foreshadowing the collapse of reason and the rule of law, leading to calamity. Canadian filmmaker Nik Sheehan has made five critically-acclaimed, widely broadcast documentary features. FLicKeR (2008), is the story of artist and writer Brion Gysin, made in the style of its subject. The Drawing Master (2005), is a vérité study of artist and teacher Paul Young. God’s Fool (1997), shot in Morocco, is the story of renegade writer Scott Symons. Symposium: Ladder of Love (1995), revisits Plato’s classic stories of the meaning of love with a cast of well-known gay Canadian artists and writers. Sheehan established an international reputation in 1985 with No Sad Songs, the world’s first major documentary on AIDS. He also works as a literary critic and journalist having written for the National Post, Now Magazine, Quill and Quire, Toronto Life, Xtra! and POV. His essay on the art collective General idea in the book Queers Were Here (Biblioasis, 2016) was recently acclaimed in the Literary Review of Canada. Cay Wesnigk (born 1962) studied visual communication at the University of Arts in Hamburg. 1987 he founded the CCW Film – Counter Clockwise Filmproduktion. Since then he has written, directed and produced several feature length and short films. These have all been shown on television, some also have been distributed in cinemas and some also in the video home market. Most of Wesnigk’s films have been shown and some even have been awarded on festivals all over the world. You can find a list of his films, as well as trailers and downloads and more information on his work here. In 2000, together with 120 other producers, directors and authors he founded the OnlineFILM AG as a public company to use digital technologies for the distribution of audiovisual content. He has worked as CEO of OnlineFILM AG (www.onlinefilm.org) since then. As a European project, www.onlinefilm.org has partnered with production companies and dedicated individuals in many European countries such as Greece, Italy, Austria, Ireland, Slovenia, Latvia and Lithuania, others are welcome to join. Wesnigk is also on the board of AG DOK, Germany’s largest community of independent producers (800 members) (www.agdok.de ). And chairman of the board of VG Bild-Kunst, the German collecting agency for creative Artists and Producers of films (www.bild-kunst.de ).